A two-minute siren sounded across Israel at 11 am Monday in memory of 22,684 fallen soldiers and terror attack victims killed since 1860. It was followed by state ceremonies at 43 military cemeteries and near the monument for the Bedouin soldiers at Hamovil Junction in northern Israel. 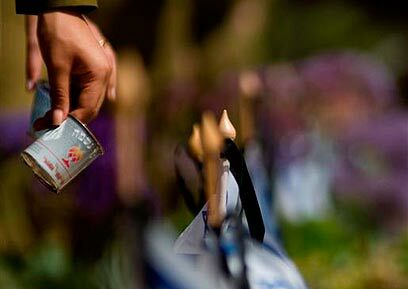 Later Monday, the prime minister, president and Knesset speaker Reuven Rivlin also attended the ceremony in memory of terror attack victims on Mount Herzl. During the ceremony, Netanyahu pointed a finger at Iran for supporting terror, called on Hamas to return kidnapped soldier Gilad Shalit and vowed to pursue the murderers. "Terrorism is not a new phenomenon. It has been accompanying us since the first days of Zionism, since the Jewish settlement in the Land of Israel was resumed in the late 19th century," the prime minister said. "Today terrorism is supported by radical Islamist regimes, led by Iran, which have turned the call to destroy Israel into their daily bread." Netanyahu stressed that the terror organizations "are in full contempt of the values and laws acceptable in the human and enlightened world. For four years now they have been holding kidnapped soldier Gilad Shalit. We won't stop working to bring him home, and I say from here – to his captors and their leaders – bring Gilad Shalit back. "Israel's hand is extended in peace to anyone wishing to live with us in peace, but we will pursue those who seek to harm us and murder our children and will collect the price of their hatred and crimes." The cabinet ministers represented the government in different ceremonies across the country. Speaking at Tel Aviv's Kiryat Shaul cemetery, Defense Minister Ehud Barak said that the fallen "are the necessary price of Israel's sovereignty in this generation. A state is not given on a silver platter and freedom is only given to those willing to fight for it. "The struggle to be a free people in our country is the fate of our generation. Israel is strong and deterring, alert in the face of any enemy, close or far, and we are willing to extend our hand in peace out of strength." Minister Avishay Braverman said during a ceremony in memory of fallen Bedouin soldiers that "the connection between the two populations cannot be based solely on the blood alliance. It is the State of Israel's duty to give our Bedouin brothers what they deserve in all areas of life." 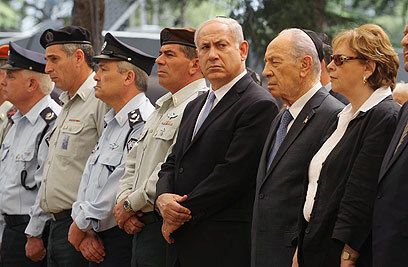 Opposition Chairwoman Tzipi Livni said during a ceremony at the Petah Tikva cemetery, "Memorial Day and Independence Day are, in my eyes, days of national self-examination, not just about the past but also about the future. We cannot only cling to the Zionist dream and the past generation. We must fulfill it, not divert from the vision, even in days of confusion. "Alongside the great pride, a bigger commitment to Israel's future and values is needed. This is the essence of the battle. The aspiration for peace is not a weakness. It is the source of Israel's strength, and praying to God is not enough. We must fight for peace and for a state which will be worthy of the sacrifice of the fallen." A ceremony in memory of Jews murdered in terror attacks and anti-Semitic incidents worldwide was held in Jerusalem in the presence of Jewish Agency Chairman Natan Sharansky. The Israel Air Force honored its fallen in a ceremony attended by Air Force Commander Major-General Ido Nehushtan and Military Intelligence chief Major-General Amos Yadlin. 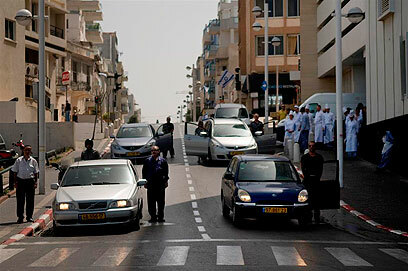 Shin Bet Director Yuval Diskin said during a ceremony at the organization headquarters on Monday morning that "Memorial Day is meant to remind all of us of the enormous price we are paying for the right to live as free people in our country here, the Land of Israel. "Memorial Day is meant to make it possible for us to understand the enormity of the right that has befallen us – the right to live as an people ingrained in its country, the right to defend ourselves, the right not to be dependent on the kindness of others, the right to live proud and free lives, the right to be responsible for our future and the future of our children." The Israeli Fallen Soldiers and Victims of Terrorism Remembrance Day ceremony opened Sunday evening with a minute's siren. Immediately following this moment's silence, the ceremony began at the Western Wall plaza in Jerusalem, with an address by President Shimon Peres, flanked by Jerusalem Mayor Nir Barkat and Chief of Staff Lieutenant-General Gabi Ashkenazi. The president began his speech with a moving address to the families of the fallen present at the ceremony, saying they represented those homes which had lost that most dear to them in the heat of the battle, in the fulfillment of their duty – "this one a son, that one a daughter, who they will never see again… this one the look in his eyes, that one the smile of a brother, a sister, gone forever." The chief of staff spoke to the families of the fallen. "Only those who have grieved… can understand. I stand before you today as a soldier and commander and during my 36 years of service I have grieved for the best… and I have returned from the battlefields with missing ranks. I understand the feeling of loss and yearning." The number of fallen includes all since 1860, including the Jewish Brigade, the underground, the IDF, the Shin Bet, the Mossad and victims of terror. Since last year's Remembrance Day, another 113 Israelis have fallen. See all talkbacks "Israel remembers its fallen"